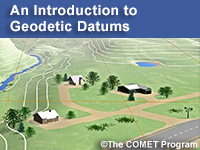 This series of short videos, produced in collaboration between NOAA’s National Geodetic Survey and The COMET Program, provides an introduction to geodetic datums for anyone who uses mapping products or other geo-spatial tools. In this video, we explore the history of geodetic datums in the United States, and how they were established at a national level to assure consistency across mapping applications. Here we examine the use of the current primary geodetic datums used in the US, NAD 83 and NAVD 88, the challenges in maintaining these datums, and the inconsistencies that arise when they are used together with the latest satellite-based mapping technologies. Explain that new datum approaches are based on GPS/Global Navigation Satellite Systems.